I am reposting the article of Jarius Bondoc in his column in Philippine Star today. My comments and discussions after his paper. Enough is enough. Developers of renewable energy (RE) must stop making us electricity users subsidize their insolvent solar and wind farms. They’re already wheedling P8 billion a year from us. That windfall, called feed-in tariff (FIT) in our monthly bill, enables their clean energy to compete with cheap but dirty coal. Yet precisely because the FIT is free money for them, they feel no compulsion to improve their output and bring down costs. And now they have the gall to ask for even higher subsidies starting next month. RE inflicts a double whammy on our monthly electricity bill. The FIT subsidy of 12.4 centavos per kilowatt-hour per se swells the bill by two percent. Worse, RE further inflates the cost of generating electricity to almost 50 percent. That’s because the mix of power sources that go into the generation grid is such that 30 percent must come from the inefficient but favored RE plants. Why is RE inefficient? That’s for the developers to explain. For decades they’ve been enjoying state subsidies worldwide to improve. Yet solar farms are only 23-percent capable of converting and storing sunlight to power. It even costs more electricity to produce one solar panel than the energy it will produce when laid out under the sun. That production process even uses acids and oxides that emit greenhouse gases and create waste, National Geographic reports. Statistics for wind are worse. The mills even directly kill flocks of birds and bats that fly into the rotors, as well as add to noise pollution. As it is now, RE worsens climate change. To justify their subsidies, RE developers must point to a bogeyman: coal. Hiding their own bad effects on health and environment, they demonize coal as a killer fuel. They want the Philippines to switch to more RE and lessen coal from the present 39 percent of the generation mix. In truth, however, coal has become cleaner than it was three decades ago. Pollution is basically the result of wasteful processes. But coal plants have tremendously improved efficiencies, and this reduced waste and pollution. That is why Europe, where environment laws are strictest, has coal making up 25 percent of the generation mix. Cases long have been made against subsidies to certain industries. Congress, controlled in the ‘60s-’70s by sugar barons, allocated billions of pesos a year to subsidize the plantations and central mills. Supposedly it was to enable the hacienderos to compete with foreigners, upgrade their facilities, and uplift their farm workers. The result is well documented. The sacada seasonal workers became poorer than ever, the plantation and mill technologies remained backward, while the hacienderos used the subsidies to buy Rolls Royces and Aston Martins. That is what’s happening today. FIT subsidies of P8 billion a year are now blocked off for the next two to three decades for the new RE oligarchs. Some of them are relatives of the very politicos who imposed the FIT subsidies. Living off us electricity consumers, they will not improve their technologies or raise salaries of their workers or bring down their costs to below that of their hated coal. Why should they, when that would mean erasing the excuse for their FIT subsidies. Meantime, Filipinos remain poor because electricity cost – the highest in Asia – discourages employment-generating investments and ultimate economic development. We electricity consumers should not let those RE oligarchs buy up all the luxury condos and executive jets at our expense. 1. 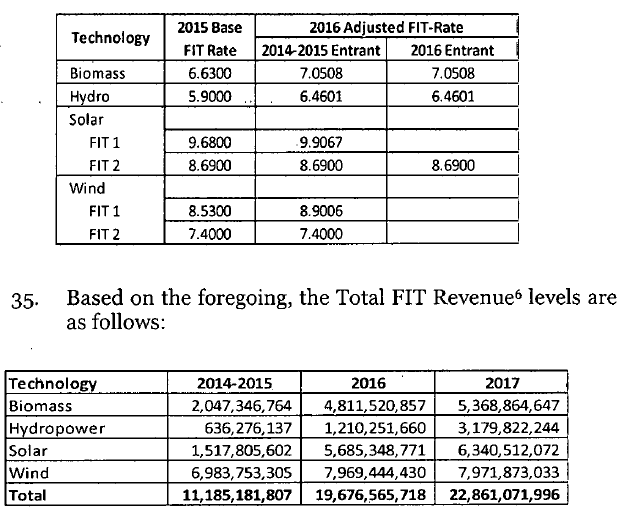 Feed in tariff (FIT) Allowance for renewables, especially wind and solar, is not P8 B a year, much larger than that. It's about P11 B in 2015, P20 B this year, and P23 B in 2017. Source: Transco petition for FIT-All for 2016, ERC CASE NO. 2015-216 RC, p. 10. 2. On solar inefficiency, its capacity factor can range from only 18% (in PH, WESM data) to 23-25% in developed countries like the US. 3. On solar panels "production process even uses acids and oxides that emit greenhouse gases and create waste", more than that, solar farms require zero trees within and near the vicinity. 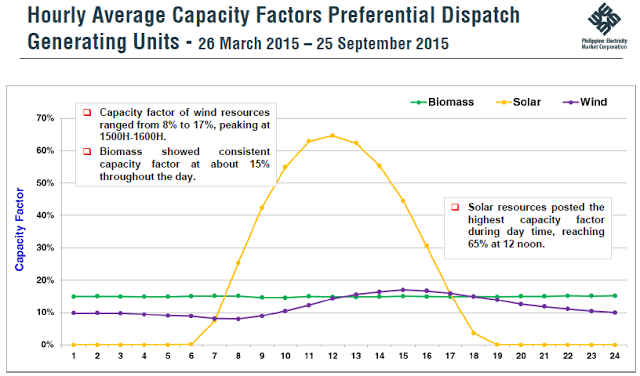 On average, it takes 2 hectares of land to produce 1 MW of installed capacity. 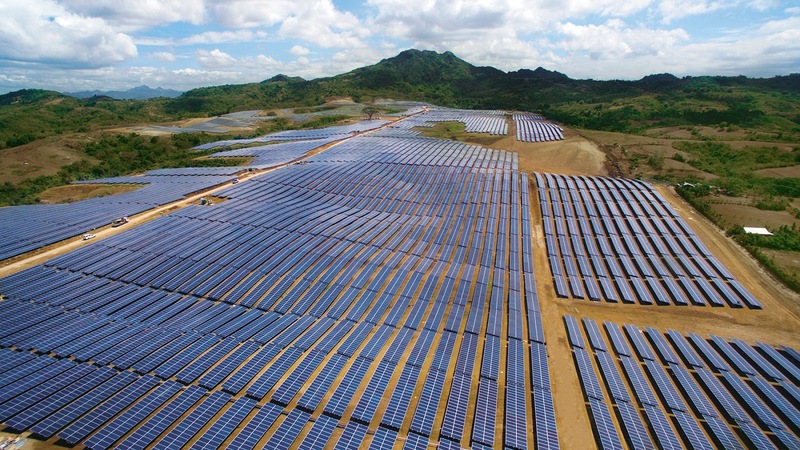 Consider this solar farm in Calatagan, Batangas: 63 MW capacity on 160 hectares of land. Zero tree allowed. The main hindrance to solar power generation is shade -- from clouds and tall trees nearby. So while many environmentalists say, "Plant trees to save the planet", the solar environmentalists say "Zero tree to save the planet." 4. 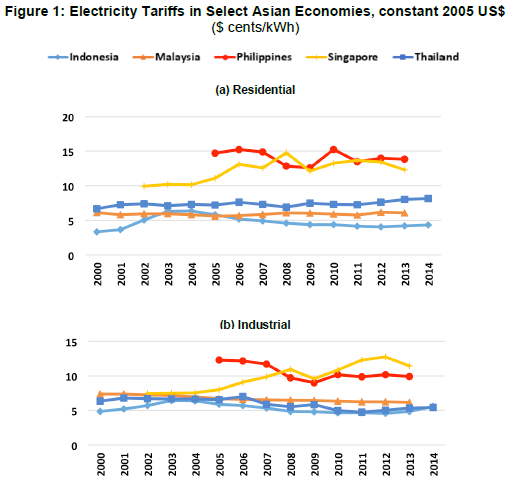 On "electricity cost – the highest in Asia", more of 2nd highest after Japan. For the ASEAN, here's one data. Source: M. Ravago, R. Fabella, R. Alonzo, R. Danao, and D. Mapa, “FILIPINO 2040 ENERGY: POWER SECURITY AND COMPETITIVENESS”, EPDP paper, October 2016, p.2. Nonetheless, it is a good paper. Congrats, Jarius. Labels: feed-in-tariff, FIT, Jarius Bondoc, renewables, solar energy.